I know that I can keep aspect ratio when scaling images by pressing the Ctrl key. But I really don't like this default. Is there a way to modify inkscape, to make scale and keeping aspect ratio the default? 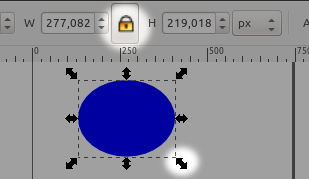 Currently Inkscape doesn't support settings like this to be embedded in default templates. A couple work arounds are to just hold down the Ctrl key while dragging the corners. Or, once you create an object and lock proportions any new object you create will automatically have its proportions already locked. Not the answer you're looking for? Browse other questions tagged inkscape scale or ask your own question.